Why do you think the flag was draped on the caskets at these three funerals? What does the flag represent? What does it mean to become "men (or women) for others?" Why is it important? Why do you think the students consider it a privilege to represent the family that is not there to be with the deceased at these funerals? Would you? 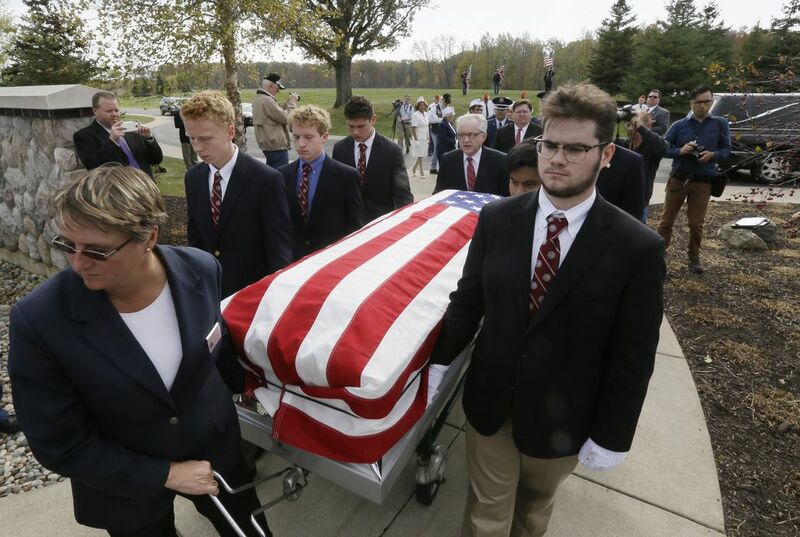 Todd Wilson, the school's director of service, said that serving as pallbearers at these funerals teaches students "the value and dignity of life at all levels." How do you think this experience does that? In this Smithsonian Channel video clip, Julian "Bud" Rice, a WWII veteran, recounts the harrowing experience of parachuting out of a C-47 under German fire on the eve of D-Day. In this lesson, students explore the ways in which women served in the Civil War, often as nurses, spies, or vivandieres. They will explore these stories through a video clip and a close examination of two dresses and a woman's uniform. This lesson plan comes with a card game called, “Who’s in camp?” The lesson gives students a deeper understanding of the many civilian and military roles that supported the American War of Independence. Students will examine artifacts and historical literature that will bring the Revolutionary War to life and help them complete a role-playing writing assignment. In this lesson, students will analyze museum artifacts and first-person accounts of daily life as a soldier in World War I and the Vietnam War. After research, students will take on different roles to create a newscast about the experience of fighting in these two wars. How much stuff is in orbit around the Earth and is it dangerous?